Daksha Mahadev Temple is a famous temple located in Kankhal of Haridwar. This is a very old temple, which is dedicated to Lord Shiva. This temple was constructed by Rani Dhanakaur in 1810 AD and it was rebuilt in the year 1962. This temple is also known as named of "Daksha Prajapati Temple". This temple of Lord Shiva is named after King Daksha Prajapati, father of Goddess Sati (the first wife of Shiva). In this sacred temple, the footprints of Lord Vishnu are made. The temple complex is quite large, in which there are two large statues of lions situated. In the main adytum of the temple, Lord Shiva's vehicle "Nandi Maharaj" is situated. It is said that what is said in the ears of Nandi goes to Shiva's ears and soon the desire is fulfilled. There is a small pit in this temple, it is believed that in this pit Goddess Sati sacrificed his life. 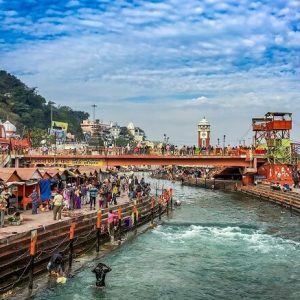 There is "Daksha Ghat" on the banks of Ganga near the holy Daksha Mahadev temple, where Shiva devotees get bathing in the Ganges and enjoying the darshan of Lord Shiva. Kankhal is considered as the in-laws of Lord Shiva because the daughter of Daksheshwar Maharaj (Goddess Sati) was married to Lord Shiva. Daksheshwar Maharaj used to live in this place. According to legend, Daksheshwar Prajapati, father of Goddess Sati, organized a yagna at this place. All the Goddesses were invited in Yajna but Daksheshwar Maharaj did not invite Lord Shiva. Seeing this, Lord Siva's wife Sati was very sad and Goddess Sati jumped in the same yagya and sacrificed his body. Listening to this, Virbhadra (which is considered to be the Gan form of Lord Shiva) separated the "Head" torso from Daksheshwar Maharaj. After that Lord Shiva put the "head of a goat" on the cut head of Daksheshwar Maharaj. Hence the name of this temple was kept as "Daksheshwar Mahadev Temple"
Saptrishi Ashram is an ancient famous ashram located in Haridwar of Uttarakhand state. This ashram was established in the year 1943 by Goswami Guru Dutt. This ashram sages and saints from all over the world and there is a centre of faith to gain a good education of life. At this place, the idols of Pandavas on the banks of river Ganga are indicated, which shows that they passed through this ashram before he going to heaven. It is also believed that the Ganga split itself into seven currents at this place. It is believed that this ashram was the adoration site of seven sages. According to legend, the Saptrishi Ashram was a meditation centre for seven sages (Kashyap, Vashishta, Atri, Vishwamitra, Jamdagni, Bhardwaj and Gautam). Once all the sages decided to pay attention to the banks of river Ganga, but due to the sound of the flow of the river Ganges, they were having difficulty in meditation. Later, the Rishis divided the river into seven different streams to reduce the noise of the flow of the river Ganga, which is called Saptsarovar. For this reason, this place is also known as "Saptsarovar" and "Saptrishi Ashram". Har Ki Pauri is a famous historical place located in Haridwar of Uttarakhand state. Har Ki Pauri is a sacred religious place and important ghat on the banks of river Ganga. This Ghat is also known as named of "Brahma Kund". This place was constructed by King Vikramaditya. The king had constructed this ghat in memory of his brother "Britharee". There is a footprint of Lord Shri Vishnu in a stone on Har Ki Pauri. According to legendary beliefs, after the Samudra Manthan, when the struggle for receiving nectar in God-demons started, then to rescue the nectar Lord Vishwakarma was taking Amrit's Kalash with the sky route was going, at the same time suddenly from the Kalash of nectar a few drops fell in the river. At that time the drops of nectar in Haridwar, the places where fell, he was "Har Ki Pauri".This is the reason that after bathing in the holy river Ganges, all sin committed by man is destroyed and he gets salvation. It is believed that King Shwet had worshipped Lord Brahma on Har Ki Pauri. Pleased with his worship, Brahma Ji appeared before him and asked him to ask for his desire. Then the king demanded the boon from Lord Brahma that this place should be known only by the name of God. Brahma Ji gave the king the boon and since then Har Ki Pauri is also known as 'Brahma Kund'. Every evening there is Aarti of Goddess Ganga at this place, many devotees come here to join the Aarti. "Har Ki Pauri" Ghat is considered to be the holiest place in Haridwar. Mansa Devi Temple is a famous religious pilgrimage site located in Haridwar of Uttarakhand state. This holy temple is one of the 51 Shakti Peethas, which is dedicated to Ma Mansa Devi. Mansa Devi is considered as a form of power, who is said also to be the sister of Vasuki Nag. Mansa Devi Kashyap was the daughter of the sage, which was manifested from his mind, therefore they are called Mansa. It is believed that both the Mansa Devi and Chandi Devi are two forms of Goddess Parvati, who live close to each other. It is also believed that Mansa Goddess is a power emerged from Lord Shiva's mind. The word 'Mansa' literally means "desire". According to the name, Mansa Ma fulfils the wishes of her devotees. The devotee to fulfil her wishes situated in the temple courtyard, on the branch of the tree, binds a sacred thread. When the wishes of the devotees are fulfilled then devotees come back and open the same thread from the branch. This custom shows immense shraddha, devotion and fidelity towards Ma Mansa. In this temple, there are two statues of Ma Mansa, an idol "eight-arm" and the second idol has "three heads" and "five-arm". With "Chandi Devi" and "Maya Devi" of Haridwar, "Mansa Devi" is also considered as the major in the Siddha Peethas. This temple of Mansa Devi is one of the main religious destinations of Haridwar. Bilkeshwar Mahadev Temple is a holy temple located in Haridwar of Uttarakhand state. This holy temple is dedicated to Lord Shiva, which situated near Haridwar is built on the "Bilva Parvat". It is a small temple, which is made of stone with the usual Shivlinga and Nandi. This temple is surrounded by a forest in a mountainous area. In this temple to offer leaves of Bel for Lord Shiva and with the water of the river Ganges, Shivling is the tradition of anointing. In this temple, Bilkeshwar Mahadev is in the form of Shivling below Sheshnag. It is said about this place that Mata Parvati here used to calm down his hunger by eating 'Belpatr', but when to drinking water used to be a problem then upon the insistence of Gods, Lord Brahma used to leave the stream of Ganga. There is "Gauri Kund" at a distance of 50 steps from Bilkeshwar Mahadev Temple. It is believed that during penance, Mata Parvati used to take bath in this Gauri Kund. Bilkeshwar Mahadev Temple is one of the main religious places of Haridwar. Gau Ghat is a holy Ghat located in Haridwar of Uttarakhand state. This ghat is situated on the banks of the holy river Ganga. It is said that mostly those people come to this ghat, who has sinned to kill cows. To get rid of this sin, they come in this ghat and the holy Ganga takes a dip in the river. Through the stairs built on the Ghats, the river Ganga can be reached. Safety barriers have also been put to up in this ghat to avoid the flow of the Ganges. A dip is to set in the Ganges by catching the barrier made of these iron. There are also many shops nearby the ghat, where the items related to worship are easily found. It is said that after Jawaharlal Nehru and Indira Gandhi's death their ashes were immersed in this ghat. Gau Ghat is one of the major Ghats of Haridwar. Doodhadhari Barfani Temple is a popular temple located in Haridwar of Uttarakhand state. It is considered as the most beautiful temple in Haridwar. This popular temple is situated in the Doodhadhari Barfani Ashram. Inside this temple premises, there are other temples, as well as the statue of various Hindu gods and goddesses. Of these, the Ram-Sita temple and Hanuman temple are deserved visiting. Along with the holy temples of Ram-Sita and Hanuman, the Doodhadhari Barfani temple is known for its architectural art. The impressive architect has provided a unique fame to the Doodhadhari Barfani temple. The entire temple complex has been constructed using white marble with beautiful carvings, which looks different from the other temples of Haridwar. The Doodhadhari Barfani temple is considered as a temple of faith and miracle. The Doodhadhari Barfani temple is one of the main religious destinations of Haridwar. Parad Shivling is a holy place located in Kankhal near Haridwar of Uttarakhand state. This holy Shivling is situated inside the Harihar Ashram. This is a unique Shivling, which is dedicated to Lord Shiva. 'Parad' means the mercury and 'Shivling' is the symbol of Lord Shiva. The Parad Shivling literally means 'mercury shivling', which is made up of about 151 Kg of pure mercury. Here is a holy Rudraksha tree in the campus, which has been present here for many years. The devotees coming here gather this rudraksha from the tree and make garland and wear them. It is believed that by wear Rudraksha get rid of many problems. To darshan Parad Shivling, thousands of devotees go to this ashram. Parad Shivling is the centre of attraction here. Bhuma Niketan Temple is a holy hindu temple located in Haridwar of Uttarakhand state. This holy temple is situated on the route of Saptasarovar. This holy temple is dedicated to Lord Shiva and Lord Vishnu. This holy temple was the establishment by Swami Shri Bhumanand Tirtha Maharaj. There are many statues of gods and goddesses installed in this temple. The idol of Lord Shiva and Mata Parvati is established at the entrance to the temple. This temple is also known as the Bhuma Niketan Ashram. In the ashram, spiritual, social, education and public health programs are also organized. There is a proper arrangement of the pure vegetarian meal for staying and eating in the ashram. Bhuma Niketan Temple is one of the main religious tourist destinations of Haridwar, which attracts the visitors coming here. Bhimgoda Kund is located near Har-Ki-Pauri in Haridwar of Uttarakhand state. This sacred Kund is situated at a distance of about 300 meters from Har-Ki-Pauri. It is a holy ancient Kund, whose name the hero of the Mahabharata epic, one of the five Pandavas, named after Bhima. According to mythology, when Pandavas were roaming in the forest, then Draupadi (Bhima's wife) seemed of the thirst for water. Around Draupadi, there was no source of water, then powerful Bhima kept his knees on the ground, which caused a pit in the ground and that pit was full of water, from which Draupadi extinguished his thirst. So this place was named "Bhimgoda". 'Bhima' is the name of one of the Pandava brothers and 'Goda' is a Hindi word for the knee. Bhimgoda Kund is one of the main holy places of Haridwar. Neel Dhara Pakshi Vihar is located in Bhimgoda Barrage near Haridwar of Uttarakhand state. This place is a point of watching of birds. Bhimgoda Barrage is on the banks of the holy Ganges river. Behind the Bhimgoda Barrage is the area of Neel Dhara Pakshi Vihar. This place is known for the variety of species of birds. This place is the habitat of different species of birds. Various types of colourful birds can be seen in this area. This is an ideal place for bird lovers. This is the best attraction place to see the Siberian crane bird. Neel Dhara Pakshi Vihar Siberian crane is known for the birds, which can be seen from the Laljiwala area. During the winter months, Most of these birds can be seen in this area. Neel Dhara Pakshi Vihar is one of the main attraction places of Haridwar, which attracts many tourists coming here. Pawan Dham Temple is a popular temple located in Haridwar of Uttarakhand state. This popular temple is on Haridwar Rishikesh Road. This temple is known for its beautiful architecture. This temple is famous for magnificent glass and mirror. Decorative sculptures inside the temple are the centre of the biggest attraction. The magnificent glass and artistic design walls are special attractions of the temple. It describes the ancient culture and heritage of India. On the walls of the temple, exhibits some the pictures of like Ganga incarnation, Krishna's Butter theft and Mahabharata related to Hindu mythology. Pawan Dham Temple is one of the main religious pilgrimage destinations of Haridwar, which attracts the pilgrims coming here very much. Sati Kund is a holy place located in Kankhal of Haridwar of Uttarakhand state. It is believed that Goddess Sati jumped into this burning Yajna Kund and sacrificed his body. According to legend, once the goddess Sati's father Raja Daksh organized a grand yajna, in which he had invited all deities, except Lord Shiva. The yajna had the place of all the gods except Lord Shiva. Seeing this insult of Lord Shiva, Goddess Sati jumped into the yajna kund. Since then, this kund is known as Sati Kund. The famous Daksh Mahadev Temple complex has a Sati Kund. During the visit of Daksh Mahadev Temple, this holy kund is also visited. This kund, called the Sati Kund, is considered as a holy Kund. Sati Kund is one of the main religious destinations of Haridwar, where the devotees are visited by. Sureshwari Devi Temple is an ancient temple situated in Haridwar of Uttarakhand state. This holy temple is dedicated to Goddess Durga. This temple is also considered as Siddhpeeth. This temple is located on "Surkut Parvat" in the dense forests of Ranipur. This ancient temple is also mentioned in Kedarkhand of Skanda Purana. According to legend, the son of Chandra Vanshi King Razi defeated and expelled from heaven, fearful Indra had done penance of Ma Bhagwati at this place with the consultation of Devguru. Being pleased with the penance of Devraj Indra, Ma Bhagwati manifest at this place and had darshan to Indra. It is believed that the devotees who come here with a true heart, Ma Sureshwari Devi destroys her sorrows. From the darshan of Ma Sureshwari, which the devotees the desire of son, they get the son receives. This temple has a great religious significance. Sureshwari Devi Temple is one of the major religious destinations of Haridwar. Vaishno Devi Temple is a famous temple situated in Jwalapur of Haridwar of Uttarakhand state. This sacred temple is dedicated to the mother Vaishno Devi. In this sacred temple has a statue of Goddess Lakshmi, Goddess Kali and Goddess Saraswati. It is believed that to kill the demon "Mahishasura", the three goddesses had taken the form of Vaishno Devi. Vaishno Devi Temple is also known as named of Lal Mata Temple. This temple is built from a wonderful architecture. Vaishno Devi Temple of Haridwar and Vaishno Devi Temple of Jammu Kashmir have similarities of architecture and tunnels. Devotees to darshan for Mata Vaishno Devi have to go through a narrow man-made tunnel. This newly built temple is an imitation of the famous Vaishno Devi temple of Jammu and Kashmir. According to the belief of this holy temple, Vaishno Goddess blesses only those people, which come here to really seek blessings from the true heart. Vaishno Devi Temple is one of the main religious sites of Haridwar. Swami Vivekanand Park is a popular park located in Haridwar of Uttarakhand state. This park is considered one of the most beautiful and quiet parks here. This park is located on the banks of river Ganga near Hari Ki Pauri. This park is in a triangular shape, surrounded by lush greenery. A huge statue of Lord Shiva is established in the park, which is about 30 meters high. There is also a large statue of great Swami Vivekanand in this park, which is the centre of attraction in this park. This park has been constructed in very beautiful ways. This park offers a magnificent view of the surrounding majestic mountains and the holy Ganges river. There is no entry fee for going to in the park. Swami Vivekanand Park is one of the main places of Haridwar, which attracts a lot of tourists coming here. Vishnu Ghat is a holy ghat located in Haridwar of Uttarakhand state. This ghat is situated on the banks of the holy river Ganga. The name of this ghat is named after Lord Vishnu. It is believed that Lord Vishnu used to take a bath here, hence it is known as Vishnu Ghat. It is said that by bathing in the holy river Ganges at this place, the sins done by man are destroyed. Compared to Har Ki Pauri, there is crowd less remains on this ghat. This Ghat is the safest and cleanest ghat in Haridwar. Through the stairs built on the Ghats, the river Ganga can be reached. Safety barriers have also been put to up in this ghat to avoid the flow of the Ganges. A dip is to set in the Ganges by catching the barrier made of these iron. Vishnu Ghat is one of the major ghats of Haridwar. Gaurishankar Mahadev Temple is a popular temple located in Haridwar of Uttarakhand state. This sacred temple is dedicated to Lord Shiva. Gaurishankar Mahadev Temple is situated near Chandi Devi temple. Gaurishankar Mahadev Temple has a great religious significance. This temple is visited by many Hindu devotees and the devotees participate in every festival that here. During the Shivaratri and Shravan Month in the temple, A large number of devotees remain crowded. Coconut, flowers and fruits are offered by devotees in the temple. It is believed that the devotee who prays with the trust of Lord Shiva, his every wish is fulfilled in this temple. Gaurishankar Mahadev Temple is one of the main religious destinations of Haridwar. Birla Ghat is a holy place located in Haridwar in Uttarakhand state. Birla Ghat is situated in the near of Vishnu Ghat. This Ghat is situated on the banks of the holy river Ganga. This Ghat is considered one of the oldest Ghats of Haridwar. During the journey of Haridwar, pilgrims go to this holy Ghat and take a bath. There are many shops near this ghat, where the items related to worship are found. Through the stairs built on the Ghats, the river Ganga can be reached. Safety barriers have also been put to up in this ghat to avoid the flow of the Ganges. A dip is to set in the Ganges by catching the barrier made of these iron. Birla Ghat is one of the major Ghats of Haridwar. Kushavarta Ghat is a famous Ghat situated in Haridwar of Uttarakhand state. This ghat was built by the maratha queen Ahilyabai Holkar in the 18th century. According to legend, the first visit to Kushavarta Ghat was done by great sage Dattatreya. The great sage Dattatreya had done penance at this place for thousand years on one foot. This ghat is situated on the banks of the holy river Ganga. Many other rites and rituals are performed, including the shradh rites for the dead ancestors at this ghat. The Kushavarta Ghat is considered the most sacred ghat in Haridwar. Through the stairs built on the Ghats, the river Ganga can be reached. Safety barriers have also been put to up in this ghat to avoid the flow of the Ganges. A dip is to set in the Ganges by catching the barrier made of these iron. Kushavarta Ghat is one of the major Ghats of Haridwar. Ma Anandamayi Ashram is a popular ashram located in Kankhal of Haridwar of Uttarakhand state. This ashram is a spiritual place dedicated to Ma Anandamayi. Ma Anandamayi was born on 30 April 1896 in a village named Kheora of Bangladesh. Ma Anandamayi died on August 27, 1982, at the age of 86. After his death, a samadhi was made to bury the remains of Ma Anandamayi inside the ashram. This samadhi is made of white marble. situated in Haridwar, this ashram is the main centre of devotion and spirituality. In the ashram, morning evening the Worship and Aarti also happen. There is also a proper arrangement for rest in the ashram at night. In addition to rest, there is get also a purely vegetarian meal to eat at the ashram. Ma Anandamayi Ashram is one of the main ashrams of Haridwar. Jai Ram Ashram is located in Bhimgoda of Haridwar of Uttarakhand state. For the ashram, Shri Devendra Swarup Ji Maharaj bought land in Bhimgoda in the year 1972. The construction of a huge building on this land in the memory of Guru Shri Jai Ram Ji Maharaj was started in the year 1974. As a result of twelve years, this building was completed in the year 1986. This ashram is equipped with public service and modern amenities. Shri Devendra Swarup Ji Maharaj has also set up charitable clinics, granaries and libraries in this building for public welfare. There is a proper arrangement of pure vegetarian food for living and eating in the ashram. In front of the ashram's main gate, there is a huge artwork of the temple and the sea-manthan. At night, when the fountain is run between different colourful lights, then its image becomes visible. Jai Ram Ashram is one of the main ashrams of Haridwar. Prem Nagar Ashram is a popular ashram located in Haridwar in Uttarakhand state. This ashram was established by Shri Hans Ji Maharaj. This ashram is known for purity, spirituality and high ideals. Scriptures and teachings are also studied in this ashram. Quotations of the texts underlining the main path of this ashram show the fundamental unity of all religions. Situated in Haridwar, this ashram is the main centre of devotion and spirituality. In the ashram, morning evening the Worship and Aarti also happen. There is also a proper arrangement for rest in the ashram at night. In addition to rest, there is get also a purely vegetarian meal to eat at the ashram. Prem Nagar Ashram is one of the main ashrams of Haridwar. Shri Santosh Puri Ashram is a popular ashram located in Haridwar of Uttarakhand state. The ashram was established in the year 1978 by Baba Santosh and Mataji. Baba Santosh Puri married Narvada Puri Mata Ji. Before the birth of his first son, Baba established Santosh Puri Ashram. In Allahabad Baba Santosh Puri had left his body in the Mahasamadhi at the age of 108 at the time of Kumbh Mela in 2001. Babaji had asked to build his "Samadhi" in the garden outside the ashram some days before the Samadhi. After the death of Babaji, Babaji's son and daughter are running this ashram. In the ashram, morning evening the Worship and Aarti also happen. There is also a proper arrangement for rest in the ashram at night. In addition to rest, there is get also a purely vegetarian meal to eat at the ashram. Shri Santosh Puri Ashram is one of the main ashrams of Haridwar. Bholagiri Ashram is located in Haridwar of Uttarakhand state. This Ashram was founded by Asharam Bapu. This Ashram is situated near Birla Ghat. Many religious activities can be seen in this ashram. This Ashram is near the holy river Ganges. The name of this ashram is named after Swamiji Bholanand Giriji Maharaj, which was a famous sanyasi. In this ashram, daily activities such as psalm and kirtan are also performed. Bhandara is also organized on special occasions in the ashram. In the ashram, morning evening the Worship and Aarti also happen. There is also a proper arrangement for rest in the ashram at night. In addition to rest, there is get also a purely vegetarian meal to eat at the ashram. Bholagiri Ashram is one of the main ashrams of Haridwar.